"Rich, chewy brownie with chocolate chips on top." Preheat oven to 350 degrees F (180 degrees C). Grease a 9x9-inch baking pan. 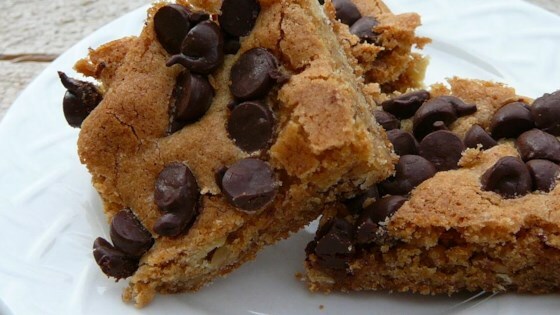 This chewy "blondie" is still plenty chocolatey, thanks to the chips on top. Absolutly amazing!! If you want to have a blondie just like at applebees make the buttermilk syrup that is on this site and pour some over the brownie.... that Makes it even more AMAZING. Double this recipe and bake in a 9x13. These are to die for...so, you'll need twice as many. I love to mix butterscotch and chocolate chips. Yum!